In the summer of 1963 a plot for revenge destroys a career, a friendship, and a family. The consequences of the scandalous event continue to reverberate, touching the next generation. Thirty years later, over the course of one day, Jon struggles to decide whether to end his affair or his marriage. His wife, Ginny, moving closer to discovering his adultery, begins working for an older man who is mysteriously connected to their families’ pasts. And Jon’s mistress is being courted by a suitor who may be more menacing than he initially seems. As relationships among the characters ebb and flow on that July day, Christina Schwarz illuminates the ties that bind people together—and the surprising risks they take in the name of love. As in Drowning Ruth, Schwarz weaves past and present into a richly textured portrait of the secrets and deceptions that simmer beneath everyday life in a small midwestern town. With page-turning intensity and in prose at once lush and precise, she beautifully conjures the emotional labyrinth of a marriage on the brink of collapse and proves that no matter how hard we work to stifle them, the secrets of the past refuse to be ignored. Betrayal versus loyalty . . . lust versus love . . . infidelity versus honor. 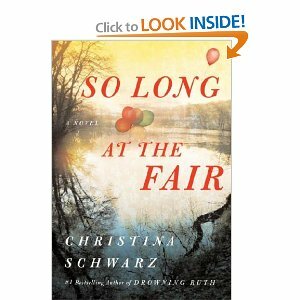 Welcome to the complex web of Christina Schwarz’s dazzling new novel, So Long at the Fair.